Uncategorized | What's Happening In The Store!? What's Happening In The Store!? Brick Fiesta Returns to Austin July 2015! No longer do southerners have to travel a long distance to attend a Lego conference. Before now, Brickfair and Brickcon were the two big Lego conventions in the country. Thanks to the Texlug and AFOLs in Texas, Brick Fiesta returns to Austin, Texas this July 23-26, 2015. Of course Anna’s Toy Depot will be exhibiting used Lego. To represent Austin toy stores and to promote the re-use of used toys, I plan to take tons of Lego mini figures such as Star Wars, Chima, Harry Potter and Ninjago minifigs. I’ll also have Lego plates, and hundreds of used Lego specialty pieces such as castle walls, windshields, and Lego wheels galore! I will have pounds and pounds of second-hand bulk Lego bricks too. See you there! Check out the Brick Fiesta website and sign up to participate. Definitely stop by Anna’s Toy Depot’s exhibit table and say hello! The ball. The triple threat! If you read my “Philosophy of Play” on my website you will see that I think a toy should have at least one of the “benefits of play” that I list as important in a toy. The benefits I like to see in a toy are, a physical benefit, a social benefit, or an emotional benefit. I wondered recently..is there a toy that has all three benefits? Well, actually I think there is! It’s the good ol’, traditional play ball! Obviously there is a physical benefit to throwing, catching and running after a ball…not to mention the physical co-ordination it develops. Socially the ball can bring together a family after Thanksgiving dinner, it can help kids make friends …or meet the next door neighbor when you need to fetch your ball out of his backyard! But how can you express yourself emotionally with a ball? Ever been hit by a dodge ball? How about when you throw a ball to a toddler? The emotions can range from competitive, to cruel, to loving and gentle. A ball might not be the favorite toy under the Christmas tree at 8:00am Christmas morning, but I bet it’s the toy everyone is enjoying most by late afternoon! Check out this giant Nobby Ball in my store! Anna’s Toy Depot sells Vintage Fisher Price too! The answer is : “Yes!” Although we focus a lot on current toys, we can’t help but love the traditional Fisher Price toys of the 1960’s to the 1990’s. We have the largest selection of Fisher Price Little People in Austin. If you are wanting to re-play favorite childhood memories, or looking to sell older Fisher Price sets..You just gotta stop in!!! Since 1994 I have been exhibiting and selling toys to psychotherapists who work primarily with children and families. 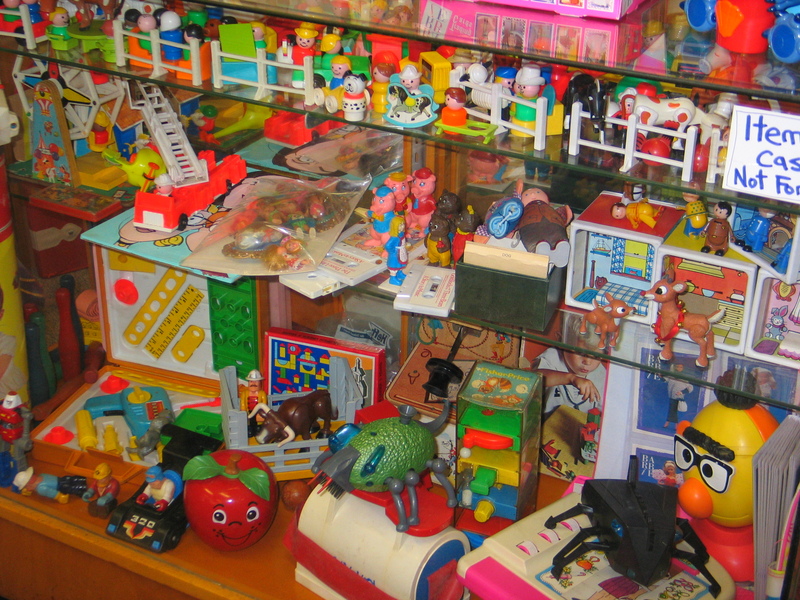 Many of the toys carried at Anna’s Toy Depot enable play that is full of role playing and self expression. I regularly exhibit at the Texas Play Therapy conference hosted by the Texas Association for Play Therapy (TAPT). I have also exhibited at the Association for Play Therapy (APT) International Play Therapy Conference in San Fransisco, Chicago, Orlando, Baltimore, and Denver. Much of my online store is dedicated to this market. Please enjoy viewing the items I have available.. at Anna’s Toy Depot from dress-up to popping martians to sand tray tombstones..I have tons of toys to fill a playroom. Okay..this is the fun stuff. I really enjoy finding figures and figurines that will be used in sand play. In the store we have large bins with $1 figures. The sand tray therapists who come into the store really love to search for unique figurines in these bins. Check out the extensive line of people figurines and the landscape and religious symbols. Sometimes I will put “lots” of sand tray figures on my site Anna’s Toy Depot for sale. I really try to keep the sandplay toys affordable so that those using sand play therapy in their practice have a vast array of choices in their playroom! I have exhibited at the Sandplay Therapists of America regional conference and I sell many miniatures and figurines to sandplay therapists worldwide. their mouths and voices. Light up toys and vibrating toys are also a favorite when searching for toys for autism or to use as diagnostic tools. I exhibit annually at the Texas Autism conference and the Texas Speech and Hearing Association (TSHA)conference, and I have been a vendor at the Texas Occupational Therapy conference and the Learning Disabilities Association of Texas (LDAT). (directly across from Matt’s El Rancho restaurant just north of the intersection of Manchaca Rd. and South Lamar ). Anna’s Toy Depot is a unique toy store that carries tons of new and USED toys. I started buying second hand toys 20 years ago. I noticed that kids outgrew many of their toys long before they were worn out, so I began buying these toys and supplying daycare centers with them. Because of the high demand for used toys, I opened my store to the public. Now anyone can walk into our store and glean through the shelves of puzzles, children’s books, play food and kitchens, puppets, dolls, toddler toys, videos, Thomas the Tank toys, play animals, Legos, Duplos, wooden blocks, action figures, Barbies, educational toys. From wooden toys to Leap Pad electronics, we have deals that even the mass merchandisers can’t offer. Stop in and check it out soon!! Click here for Pictures!